Now it’s clear – Houston, Mid-Ohio and Lime Rock will be contested by R8s, the balance of the season (Salt Lake City onwards) by the R10s. 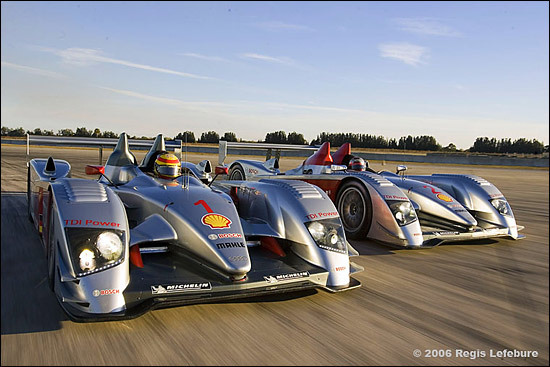 “Audi returns to the world’s most popular sportscars series at a factory level,” says the company’s statement. Audi Sport, Team Joest and Champion Racing “will cooperate closely” during the ALMS season, Champion Racing providing support for the R10s in the ALMS (although the entries will be in the name of Audi Sport North America). So the R8s and the R10s won't, as strongly suspected, be competing together on the track - and Lime Rock Park looks as though it will be the last race ever for the Audi R8 in current competition. 61 wins from 77 races so far - with three races left. It's not yet clear whether the R8s will complete in Champion or Audi livery for these three races.